The Cifer 2683 was the stand-alone version of a large range of dumb terminals released in the UK by the Cifer Systems Limited Company. The 2683 was actually a Z80 based 2632 terminal to which a second Z80 card has been added, providing 64 KB of user RAM and a floppy-disk controller. The machine was used as a Z80 software development or general purpose CP/M system. A ROM/EPROM card allowed to develop and run custom programs. A 300 x 1024 pixel graphics board was also available, including a third Z80A CPU and providing Tektronix 4010 compatibility. A 2684 was also released, with same features as the 2683 but including a built-in 5.25" floppy-disk drives instead of an external unit. We had a couple of Cifer 2683s in our student flat about ten years ago. I'm not sure how much I can tell you, but I do remember that the keyboard was much more colourful than the one in your picture. The terminal's bell was a "meep", very high-pitched with soft edges. I worked for Cifer as a field service engineer during the 80/90s. I had experience of working on all of their 'dumb' terminals through to their Unix 'fan heater' systems. They had a number of large clients including the Countryside Commission and BLCMP (providing library services to Poly's and Uni's). 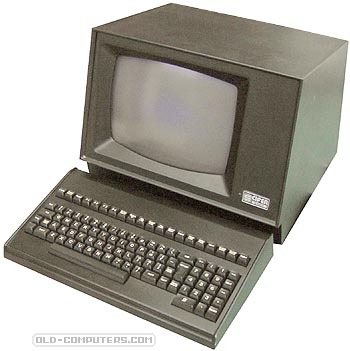 The BLCMP version of the 2600 series had a bar code pen attached to the keyboard. It had a seperate board within the keyboard that generated the bar code when the pen was scanned. This was fed to the keyboard port as if you had typed in the code. The pens were always breaking down because the originally used a filiment lamp as the light source. We fitted an upgrade using an white LED which made the far more reliable. The pen tips would wear out though. One version of the pen included a built in date stamp.. A library book issuer could scan a book to a student and date stamp for it's return all in on go ! We were expected to repair to component level on-site. I dread to think what H&S rules were broken when we exposed the CRT on a library counter. Good times though - I did get sick of being taken for a library person at counters by often very rude students. What those staff had to put up with !!! Cifer also made the 9000 series unix box. It didn't have any keyboard connections and you had to connect a terminal to make it go via a network ring adapter. Up until Cifer being sold off there were several engineers who could service these systems. I became one of the last and used to hold onto the rebuild system that contained all the software needed to rebuild a 9000. The filestore on the rebuild box contained a folder labelled Junta. This is where all the OS Kernals were stored ! The main office/production was in Melksham. I joined the Northwich office - a samll industrial unit. We relocated to Eccles when we merged with another company. I trained in Melksham workshop when I first joined. We used to receive systems from a sweet manufacturer. To ensure their systems got priority they used to package them in boxes filled with sweets ! Just to add to this Cifer remains live and well in Wilstire. These terminals are still in use, the 2600 series and indeed the T series, are still maintained on several sites and obviously last a lot longer than todays units! The colourful keyboards mentionad by Ian Chard were used primarily for the library systems along with British Rail. Special thanks to John Ball who donated us this computer ! see more Cifer Systems 2683 Ebay auctions !